Just wanted to start this post of by saying a massive thank you for 1K followers on my Bloglovin’. Its so crazy to think this little blog of mine has that many people reading a long, I’ll be forever grateful. Anyway, onto nail polishes haha! I have a pretty decent nail polish collection I’d say, but Essie seem to be the most popular brand of the bunch. 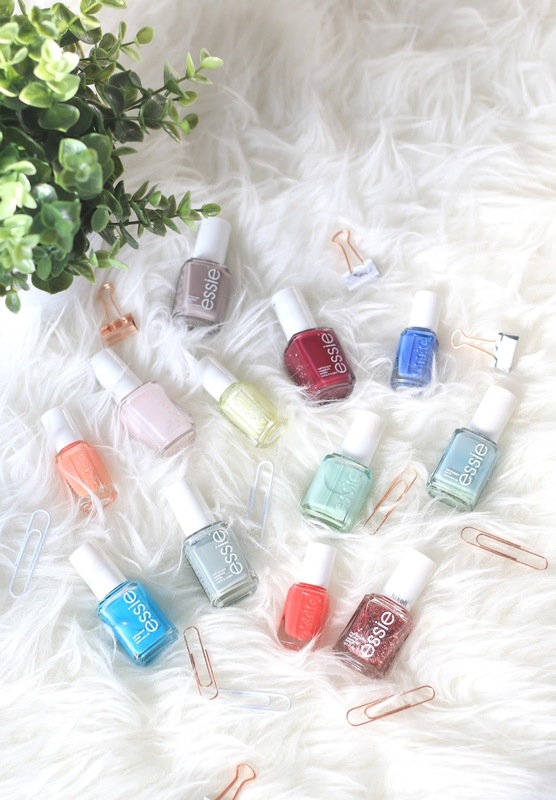 I think Essie nail polish posts are a thing? 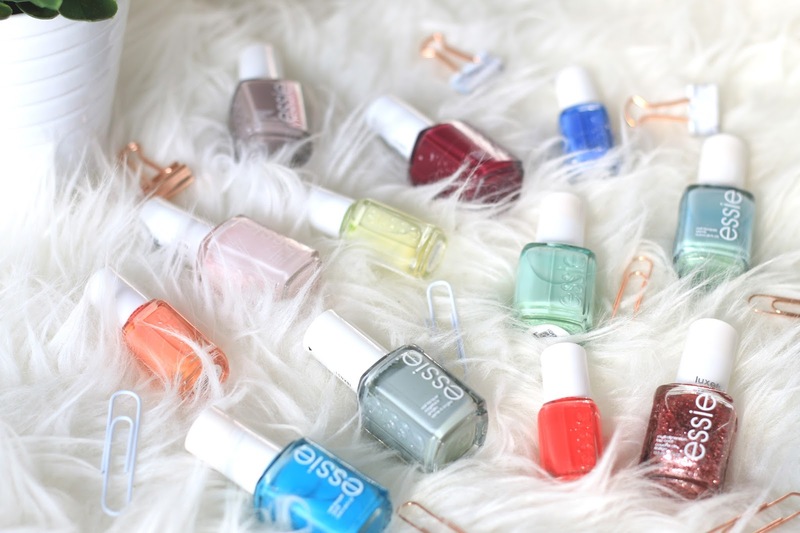 Well anyway, I’m doing one so heres all the Essie nail polishes I own! How many times do I want to say Essie haha?! Lets start with the brights shall we? I’m Addicted is a bright blue shade, which I think is so perfect for the summer time. I never really see a lot posted about this gorgeous shade, but I love it! Next up is Sunset Sneaks, which was part of the summer 2015 collection. This is one of my favourites in the summer months. Another two from the summer 2015 collection, were Peach Side Babe and Pret-a-surfer. Peach side babe is obviously a gorgeous peachy shade, which again, great for summer. Pret-a-surfer is a shade I like to wear all year round, its a lovely cool/calming blue. Okay, so not all of these are necessarily pastels but thats the only name I could think to group them all together, and I only have one glitter haha. Lets go with Fiji first, a cult blogger favourite. Its a super pale pink, that isn’t ridiculously transparent when you first apply, in fact its nice and opaque with two coats. Fashion Playground is a lovely pale/pastel mint green shade. Although, probably my least favourite out of my collection as it doesn’t apply very well. Chillato isn’t really a pastel colour, but it kinda fits into this category. Its a beautiful pistachio green colour, that was also from the summer 2015 collection, one I need to wear more often. Lastly, we have the glitter which is A Cut Above. A lovely pink/silver glitter that looks perfect over the top of Fiji. Onto my favourite now, the darker colours and greeeeys. One of my newest additions to the collection is Bahama Mama, another highly rated polish amongst bloggers. Rightly so, its a beautiful rich purply/burgundy shade thats perfect for autumn/winter. Chinchilly is also another recent purchase, and one I haven’t gotten round to using yet. Its a dark greyish/brown shade, looks very interesting and I’m excited to give it a go. The last two polishes are, Maximillian Strasse Her and Parka Perfect. Two super pretty ones. Maximillian Strasse Her, was the first full sized Essie polish I got in a giveaway and I was so excited about it. I remember Lily Pebbles hyping this up, and I’m so glad I got it, its one I go back to time and time again. Parka Perfect is a very similar shade, but more blue toned and equally as pretty.